Planning to send Christmas cards this year? It's not too late! Picking a card for someone is an event for me. I can't "just run into the drug store and pick a card." I'm actually horrified at the thought. I peruse the racks of cards at book stores and independent shops and wait for the 'Ah-ha! This is the card!' moment before picking one. I have two makers to share with you who each deliver something a bit different to suit your needs. Buttercup Co.'s cards are the perfect mix of hilarity and thoughtfulness. I know they may not be everyone's cup of tea, but they certainly are mine. I think my favourite has to be "All I want for Christmas is you. And a cat...and a million dollars." The best part? They have more than holiday cards! Looking for a birthday card or sympathy card? I'd get a chuckle out of receiving the "When life gives you lemons, drink tequila" card. 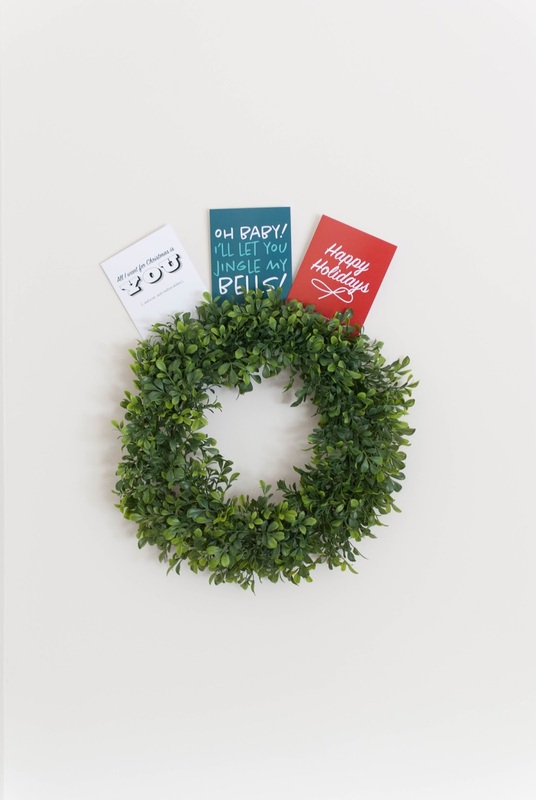 Buttercup Co. also has a limited edition 2017 holiday greeting card that you can purchase in their Etsy shop. This card is in support of the Ottawa Shoebox Project. It has a really nice greeting in it as well - no cheekiness in this one! Have I convinced you to include a card with your gifts yet? I met Stephanie through the Rising Tide Society. I've had the pleasure of working with her on a few projects (like this southern bridal inspired shoot and my so long summer shoot.) Steph is an extremely talented calligrapher who has an entire collection of greeting cards for any occasion. 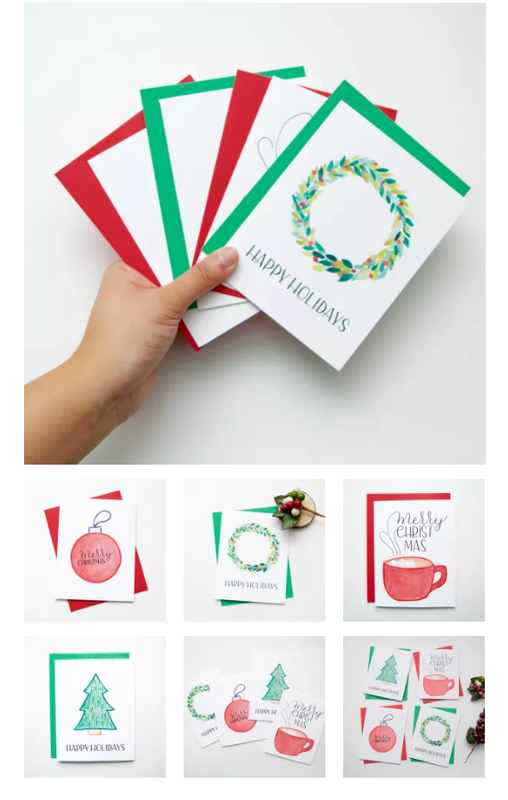 If you're looking to amp up your Christmas card game this year, check out Stephanie's collection! Her Christmas card set includes 8 cards (2 of each design) for just $25. Run, don't walk, to get them while you can! But wait, Stephanie doesn't stop at cards! She also has prints that are gorgeous. I think everyone in Ottawa should own the watercolour map print! Online shop or one of the many stockists in Ottawa! Where are my coffee lovers at?! I wish I could say I fall into that category but I am a tea kinda girl. I appreciate an iced coffee in the height of summer but I've yet to bring myself to enjoy a hot cuppa coffee. But, I do have friends and family who appreciate a good cup of coffee and Barking Barista makes the cut! Unfortunately I can't talk too extensively about the different between a light roast and a dark roast because truthfully I have no idea, but I can encourage you to take my word that a bag of Barking Barista beans will definitely be appreciated on Christmas morning. Now, are you ready for this? Their mission alone solely wins over my heart: they work with dog charities! As someone who extensively bothers her boyfriend for a dog on a regular basis (like I ask him every day with the hope that one day he'll just cave) this pulls at my heart strings. Barking Barista works with dog charities of all kinds - not one in particular because it allows them to spread the love. Each purchase goes towards helping dogs! They donate a portion of all of their sales to help a dog or rescue in need, they allow dog-related charities to buy and resell their coffee for profit, they attend, sponsor and support dog fundraising events, and they donate coffee to rescues to serve during events. I CAN'T EVEN. THEY HELP DOGS! In case you can't tell, I am a huuuuge animal lover so I could probably type all day about how much this means to me. 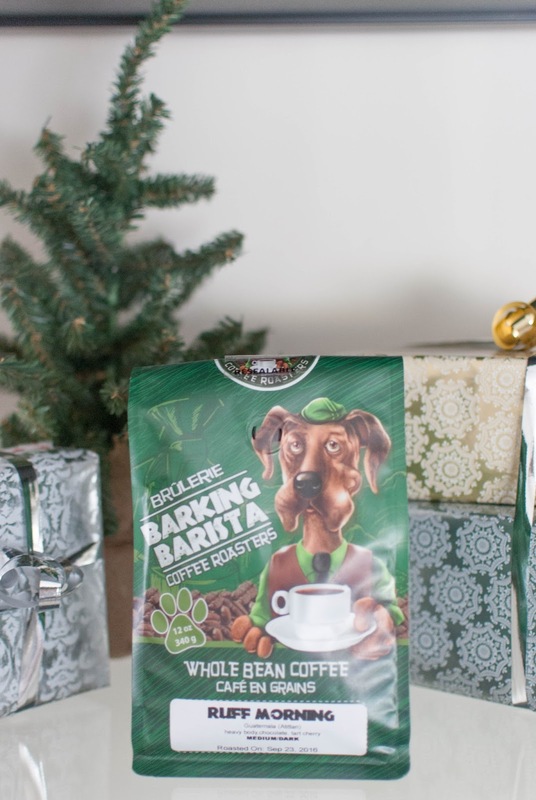 Everyone I know is getting a bag of Barking Barista coffee (or 10) this Christmas. Even if they don't like coffee. Because dogs! Price point: A bag of beans will run you $15 (and a portion of that goes to dogs!) and for the coffee afficinado in your life, you can purchase a Coffee Subscription for anywhere from $90-$270 depending on the length of the subscription. So I may not know a lot about coffee but I do know enough about something to satisfy a sweet tooth. My sweet tooth dictates my life. I've always had one and I probably always will. Cookies are my vice, but an artisan chocolate bar comes in at a close second. I've been admiring Alijca's talent for a long time. She's known for her postcard chocolate bars and eye-catching branding. Each chocolate bar is packaged in a colourfully crafted envelope. Yes, an envelope! The front has the product info and the back has space for a message, address and stamps. You can mail chocolate to your far-away BFFs or family this Christmas and they won't even expect it! Are you ready for some of the flavours? How about Cereal and Milk? White chocolate, honey cereal, cereal marshmallows... Or what about Matcha: a blend of white chocolate, green tea, matcha and matcha powder. Even those who typically air on the savory side will appreciate a treat from Alicja Confections. 613 Craft POP-UP! until December 24th at 432 1/2 Preston St. Visit the Facebook page for hours and details. Or check out her website! 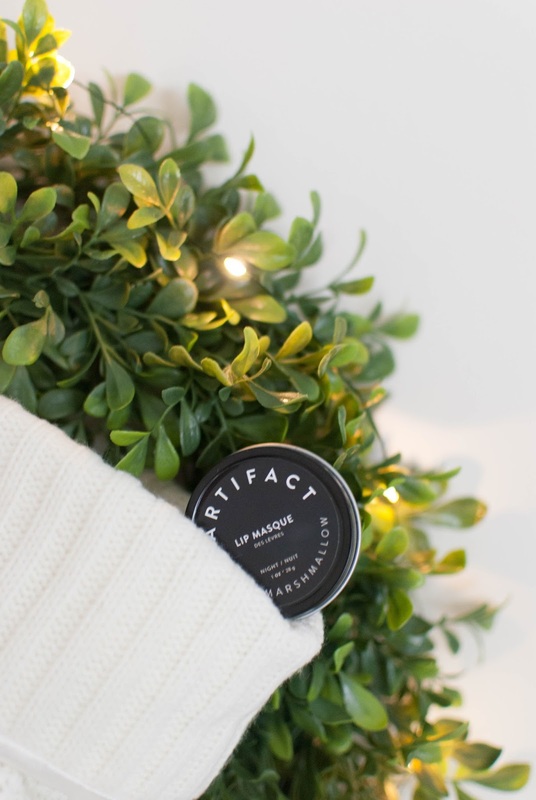 I have a full post coming this week declaring my absolute adoration for Artifact Skin Co. and what it has done for me over the past few weeks. I could go into great detail but I will wait and in the meantime tell you that this Honey Marshmallow Lip Masque is divine. Do you have a beauty junkie on your list? Or someone that suffers from chapped lips? Or really just anyone you're looking to pamper? This is an excellent stocking stuffer! This lip masque deep conditions and smooths to soothe dry and chapped lips. It's the perfect gift that someone may not think to buy for themselves. Guaranteed it'll be appreciated by the gift-receiver! Do you have someone on your list that you'll be kissing in the near future? You'll probably appreciate it as well. This product is a cult-favourite for a reason! Or visit the Indie Apothecary online shop! Did you think I was only going to share one option for a sweet treat? I told you, my sweet tooth runs my life! 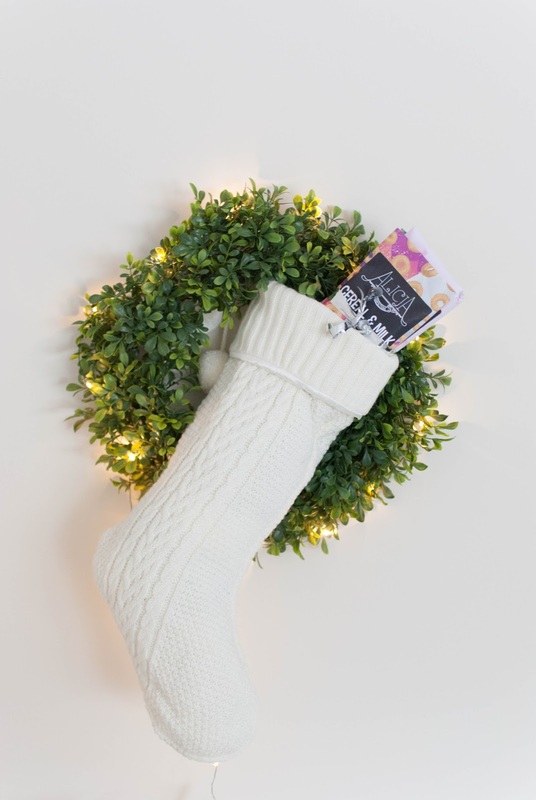 I think the squares from Totally Squared are the perfect thing to bring into the office to share with your co-workers, or to individually wrap up and add to any gift basket or holiday potluck. If you're not up to gifting the actual squares, Totally Squared also offers a digital download of their recipes! Do you have a baker on your list? This is a really neat way to help expand recipe collections! As a self-proclaimed baker I am always looking for new recipes to try out so I have to say I'm a huge fan of this idea! 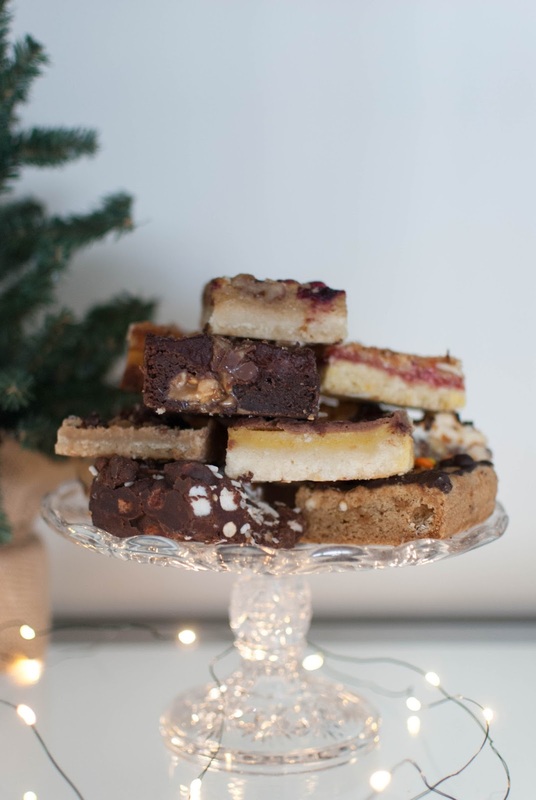 To give you an idea of the delectable treats that they offer, you could treat your friends and family to Caramel Brownies, Chewy Triple Chocolate Walnut Squares, or Millionaire Shortbread. I'll take 10 of each, please! Holiday baking can be a lot of work and very time consuming (as someone who volunteers to do the bulk of it every year, I know first hand how much effort goes into it!) so there's nothing wrong with taking a break and picking up treats for the holidays! Consider Totally Squared if you've got a party to go to or someone who deserves a sweet pick-me-up! Price point: Digital recipes are on sale for $1.99, trays of squares are $25 and up - their variety pack is $30 in case you don't want an entire pan of one kind. Place your order online and pick-up at their head office or have it delivered! Holiday orders have to be placed by December 12 and the pick-up and delivery deadline is December 18 so get shopping! Gentlemen, this one is for you. 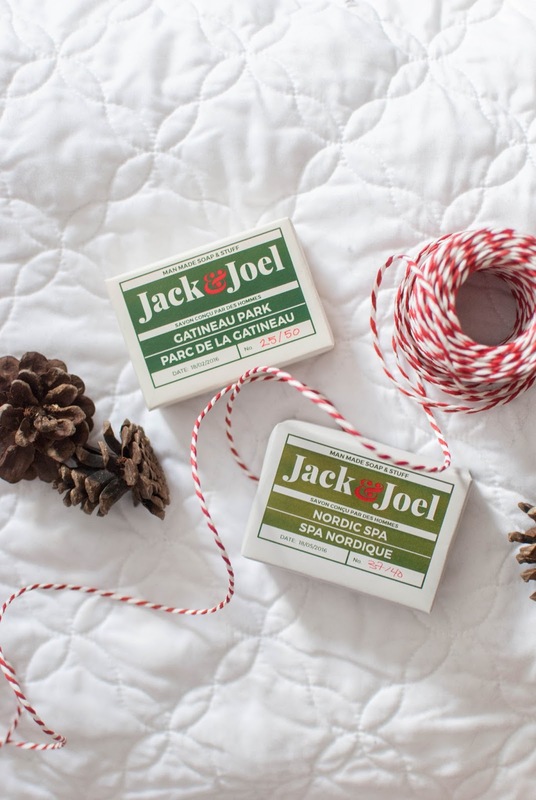 Jack and Joel is a locally owned soap company in the Ottawa area. Their products are crafted for the gentleman in your life. Their soaps are all handmade and only tested on party animals *wink* so you know it's good stuff. Their soaps last long because their soaps contain lard (sorry vegan friends!) and they let their products cure for at least 6 weeks before they hit shelves. This is quality product here, folks! Or shop online! Free pickup if you're in the Ottawa/Gatineau area for orders over $30. Well my friends, hopefully that gave you at least one idea to aid in your shopping! I was certainly inspired as I was putting this together so I know that I'll be able to cross a few things off my list in the coming days. It's just convincing my boyfriend that it is a good idea to start shopping before December 24. Watch here next weekend for the final installment of my 613 gift guide covering one of my favourite categories: house and home! 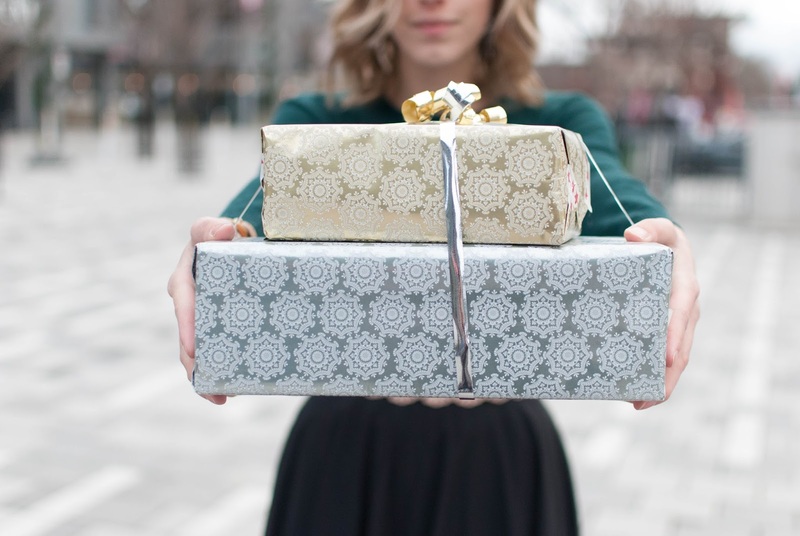 In the meantime, let me know if you've bought anything from any of my gift guides! I'd love to hear how you're supporting local this holiday!